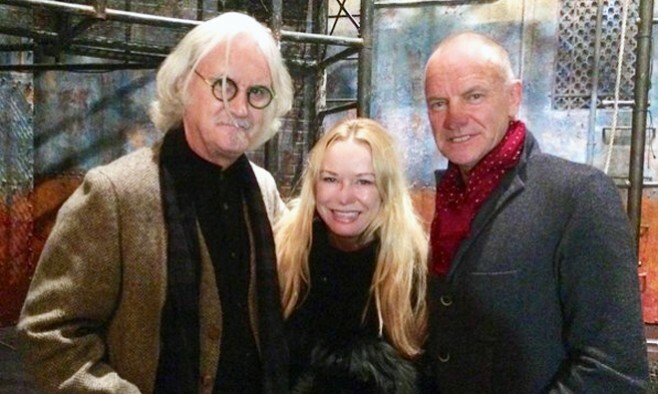 Billy Connolly’s wife, Pamela Stephenson (pictured above with her husband and singer Sting), has opened up about the comedian’s Parkinson’s disease, saying he is able to look on the brighter side of life with the condition. Connolly, 73, was diagnosed in 2013, but has continued to take to the stage around the world, including an epic 15-night London run of his High Horse tour at the start of the year. Stephenson, who has three children with Connolly, said in an interview with Woman & Home magazine: “Billy is actually doing really well. He continues the voice exercises that help to maintain his vocal texture, but that would be necessary even if he didn’t have Parkinson’s. Coming to terms with his diagnosis, however, was the most difficult part for his whole family. Pamela revealed: “To say Billy’s diagnosis of Parkinson’s was a shock is an understatement. No one in our family really knew what it meant. To be honest, we still don’t. She also admitted misreading some of the early signs of his Parkinson’s because she was viewing the symptoms from the perspective of a psychologist. In a recent TV series documenting his road trip across the US, Billy declined the offer of cannabis as a treatment for his Parkinson’s symptoms after meeting an organic marijuana farmer in Oregon. Scottish comedian says doctors should "leave door open for hope"